Hey! Are you an artist who also happens to be age 12-18? 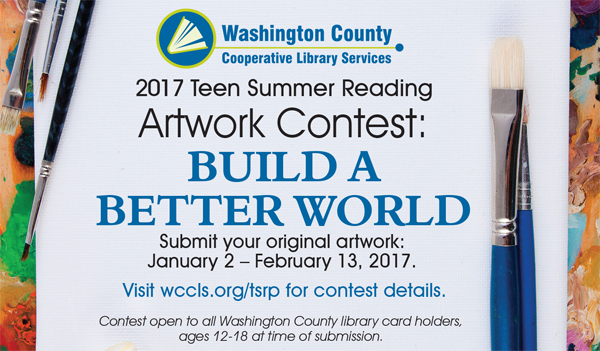 Submit a design to our Teen Summer Reading Artwork Contest! The winning design will be used on 2017 Teen Summer Reading program materials across Washington County, including posters, bookmarks, flyers and more. The contest opens Monday, January 2, 2017, and the last day to submit your entry is Monday, February 13, 2017. Click here to get all of the contest details and the entry form (PDF). Winners will be announced at the end of March. Good luck!